Zia’s gloved fingers jabbed out the control sequence again, but she knew it was futile: the hab was dead this past year. She’d been sent from Central to discover how, why. This was the sf book that had lingered longest unread on my shelves. Next in that pile is Hybrid, by Shaun Hutson. Thanks for your comments on the book. 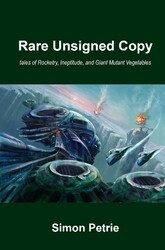 Re the purchase link, I should note that Rare Unsigned Copy is now out of print and unlikely to be easily found; some of its stories, including 'Running Lizard', can be found in my new collection 80,000 Totally Secure Passwords That No Hacker Would Ever Guess, out at the end of this month and currently available for preorder from the usual suspects.